Installed on this roof was the Owens Corning Tru-Definition Duration shingle in the Terra Cotta color with the Royal Brown drip edge. Also installed were 6 Velux fixed deck mounted skylights along with a new smart vent and three Anderson window replacements. Middle Creek Roofing just completed this 38 SQ, 5/12 pitch roof on this 1 1/2 story stone ranch style home. The customer chose to go with the Owens Corning Tru-Definition Duration shingle in Brownwood with Musket Brown drip edge. Also installed was new copper chimney flashing, all new face boards and musket brown vinyl soffit, fascia, gutter, downspouts, and elbows. Looking for an estimate for a metal roof on the house and an asphalt roof on the garage. Or metal on both. Need a new main roof, porch roof and back porch. We currently have solar panels that we are scheduling to have removed so we can have a new roof installed. Home is for sale and home inspection revealed water stain in attic (currently dry). There was an issue 5 years ago with ridge vent during a storm but never had a problem since. Need to have roofer look at to determine if there is a current issue, and if so, what repairs are necessary. The North side of my roof is leaking. Roof has some leaks. Looking for a replacement. I need an estimate on replacing the shingles on the back half of my roof. Middle Creek Roofing replaced the roof on our house. From the day they first came to give me an estimate, I could tell they were a good company. They were able to finish the work for me in one day and did an excellent job. Also they cleaned up extremely well when the job was done. I would definitely recommend them. The roof problem was taken care of with no problems since. The gentleman who did the work was very courteous. "Impressed and amazed. The four man crew are hardworking,..."
Have you been noticing that your roof has leaks, missing or broken shingles, discoloration, or a sagging structure? If the answer is yes, then it's time to call in a professional roofing contractor right away to assess the damage and repair the problem. Middle Creek Roofing is a full service roofing company that you can trust for all of your roofing needs in Lebanon, PA and the surrounding area. Your roof should keep you dry, warm, and protected from the outside elements. Even the smallest sign of damage can cause serious structural damage later on that will keep your roof from functioning properly, so don't wait to call in our professional roofing experts! Winters can be harsh in Lebanon, PA, and ice and rain can wear away even the sturdiest roof. Our ice melt systems, ice dam prevention, and ice dam removal services will keep you safe and secure through the colder months. Middle Creek Roofing is your proven roofing contractor if you have any damage at all, from the general wear and tear of age to structural collapse or serious leaks. No project is too big or too small, and we promise our clients quality results that will last for years to come. Slate roofs are some of the most beautiful to look at as well as the most durable roofing options available. Slate roofing is also very environmentally friendly as it is all natural and won't contribute to your carbon footprint! Overall, a slate roof may cost a bit more than a regular shingle roof, but it's long-lasting and maintenance-free qualities easily make it the best value for your money. Middle Creek Roofing is your best choice for all of your roofing needs in Lebanon, PA. To schedule an inspection and get your free estimate, contact us today! 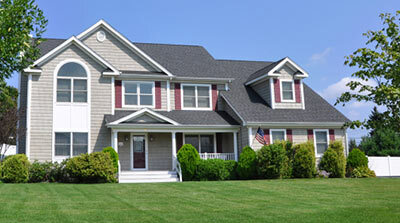 Middle Creek Roofing offers a wide variety of asphalt shingle colors, brands, and styles. These durable asphalt shingle roofs last from 20 to 25 years on average. These customers were very pleased with their new asphalt shingle roof. As one Customer stated on her review, "We couldn't be more impressed with the Middle Creek roofing team. They exhibited the utmost of professionalism, diligence and dedicated workmanship throughout the roofing installation process. We haven't seen a team work harder or more efficient like this in a long time and can't thank them enough!" Installed on the roof was the Owens Corning Colonial Slate with charcoal grey drip edge. Middle Creek Roofing had just recently installed a new roof on this customer's home. They installed the Owens Corning Shingle color in Driftwood along with new White drip edge. Customer stated when the job was finished "he'll be bragging about us and will also be referring us to others. A couple days later we had a storm and the customer called in to tell us he had some concerns with a few shingles that lifted at the peak where the garage meets the main roof. Middle Creek's service technician was out the next day and secured the shingles. The customer again was very happy with the quick response and dedication the company offered. Roof needs replaced, leaking. Peaked roof on two story home. I need the back top roof replaced. Three tab shingles. I would like to get an estimate for a new roof on my home in Lebanon (I work in NYC - my daughter is living in the house). The estimate is for re-roofing of both the house and detached garage. I am looking to have the work done as soon you could fit in your schedule. i am also looking for the best price! The main thing is age with shingles missing so it is time. I also have an area around a chimney that needs addressed. Not sure if you would handle that portion of if we would need to get someone else involved. I am interested in getting a quote on a new roof. I recently bought my house and there has been some leaking problem on past and would like to find out how much it be to get roof redone before any other problems start. Need a new roof. Would like a free estimate for shingle replacement. I live in a townhouse built in 1991 with the original roof, looking to get an estimate for replacement.